These are the first modern trams of Latvia, the model "For City" built by Škoda in Czech republic. These are also the first trams in Latvia with normal pantographs. All the communist era models still used the very old fashioned trolley bar systems instead of normal pantographs. 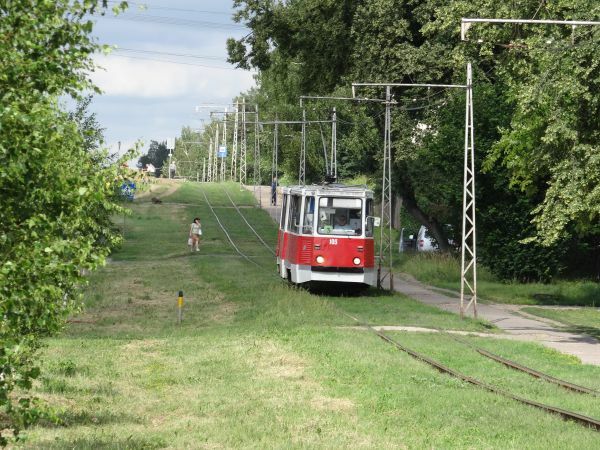 In the beginning the Tramways of Riga could only use these new Škodas on only one line, because at other places the overhead catenary wires were not suitable for other than trolley bar use. 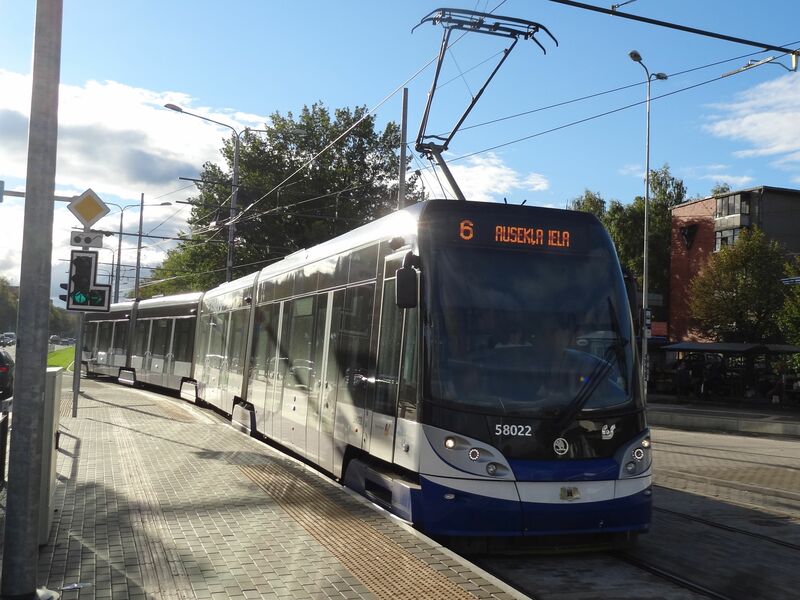 But now lately the city of Riga has received some infrastructure money from the European Union to renew their tram catenary systems and Riga has also ordered more of these new Škoda trams. Picture at Jugla, Riga 28.9.2013 by Ilkka Siissalo. Another view of the same Škoda tram unit as above. Picture at Jugla, Riga 28.9.2013 by Ilkka Siissalo. 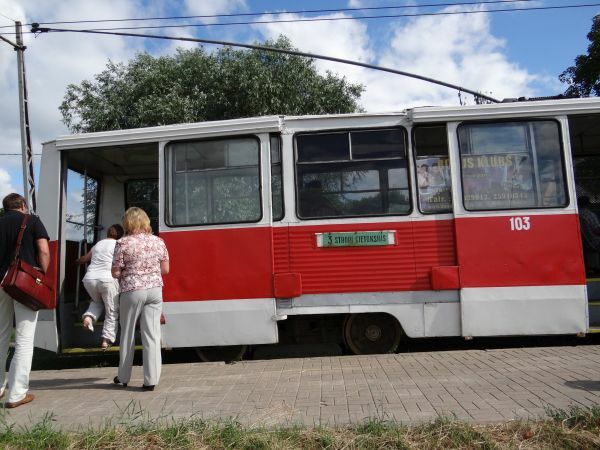 The same Škoda tram seen from the other side. Picture at Jugla, Riga 28.9.2013 by Ilkka Siissalo. 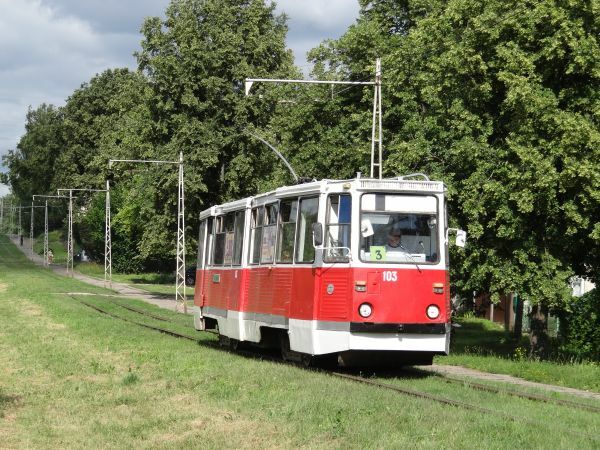 Most of the tram traffic in Riga has been carried out by old communist time Tatra trams, just like in so many other communist countries. All the trams before the new Škodas used trolley poles. 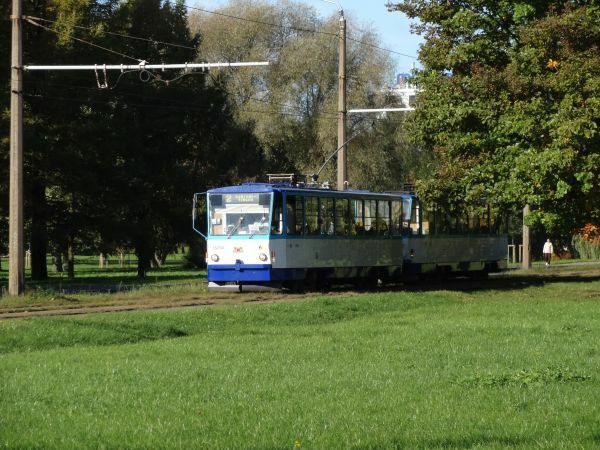 These two are of the older Tatra type T3 and they are here driving along the Slokas iela on tram line 2 on the 7.10.2012. Picture by Ilkka Siissalo. 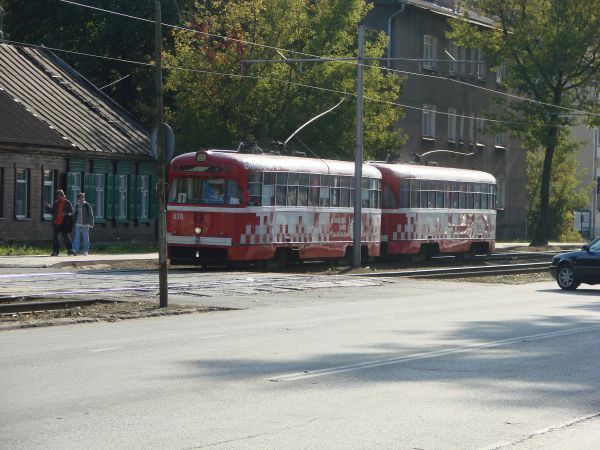 2x 2 old Tatra T3 wagons meeting on the corner of Slokas iela and Barinu iela on the 7.10.2012. Picture by Ilkka Siissalo. Two Tatra T3 wagons on line 5 on the Akmens bridge. Picture 7.10.2012 by Ilkka Siissalo. One of the newer Tatra T6B5SU trams taking passengers on Slokas iela on tram line 2 on the 7.10.2012. Picture by Ilkka Siissalo. 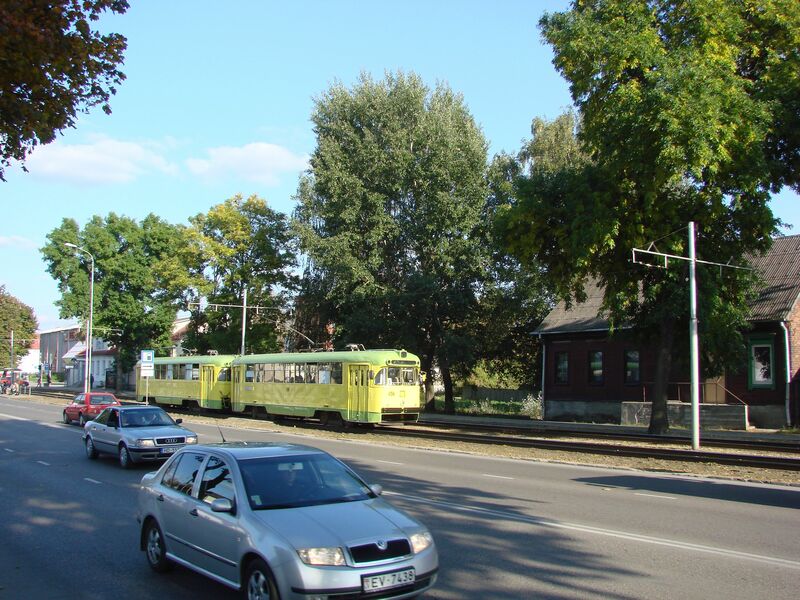 Two Tatra T6B5SU trams on Slokas iela on tram line 2. The "SU" at the end of the version name refers to Soviet Union and the fact that these tramlines are of the extremely broad 1524 mm gauge. Compared with the familiar Tatra wagons of many other eastern European countries these wagons even look extremely broad. Picture on 7.10.2012 by Ilkka Siissalo. 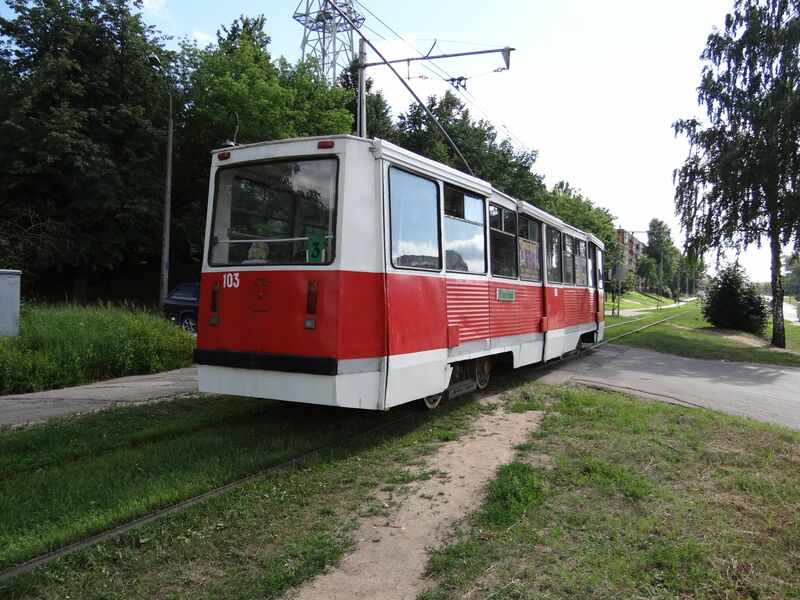 Tatra T6B5SU trams seen from behind. Picture on Slokas iela on 7.10.2012 by Ilkka Siissalo. 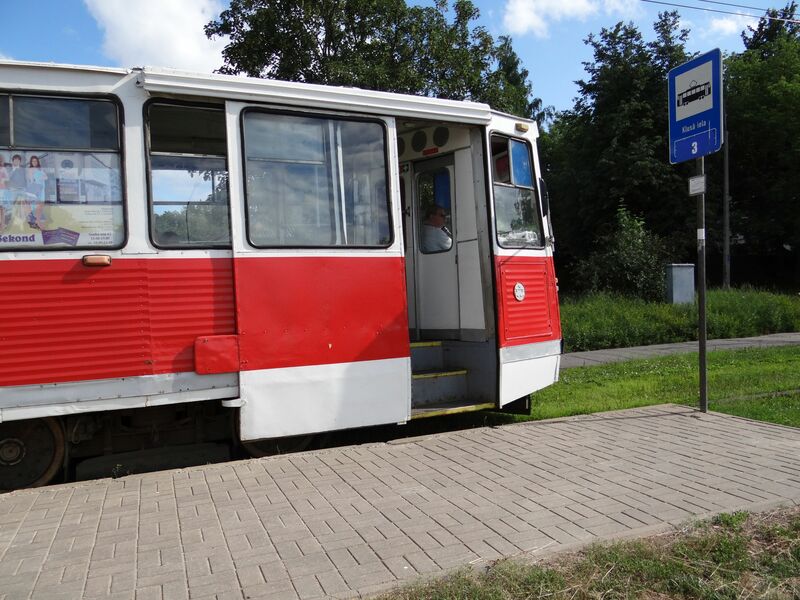 After renovation the Tatra T6B5SU trams look still fairly modern. Picture on Slokas iela on 7.10.2012 by Ilkka Siissalo. The trolley style catenary wires look like a mess in some of the street crossings. A Tatra T6B5SU on Barinu iela on 7.10.2012. Picture by Ilkka Siissalo. After Latvia's regained independence but before renovation of the old trams, there was a time when almost all Riga's trams were covered by ad tapings and they were in a fairly bad overall condition. Picture of a Tatra T6B5SU tram by the Rīgas Centrālā stacija 8.12.2007 by Ilkka Siissalo. 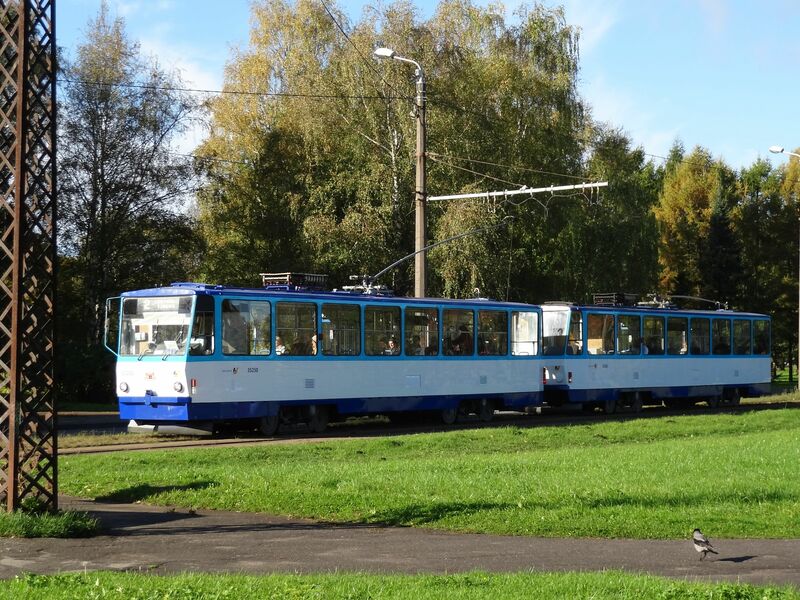 A pair of ad covered Tatra T3 trams at Jugla, Riga. Picture 4.7.2007 by Ilkka Siissalo. The lady in the picture is train photographer Sanna Siissalo. 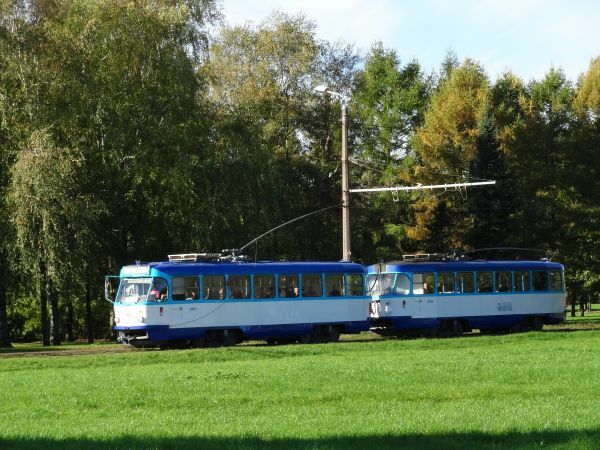 A pair of advertisement covered Tatra T6B5SU trams in Jugla. Picture 4.7.2007 by Ilkka Siissalo. The city of Daugavpils (The name means bridge over the river Daugava) is a fairly large but not so very rich, very Eastern European looking city in eastern Latvia. Daugavpils has a tram system with old broad gauge 1524 mm tracks and very old trams from the old communist times dating back to 1946. The rolling stock comprises RVR-6 vehicles built in Riga and the KTM-5 and KTM-8 built in Ust-Katav, Russia. 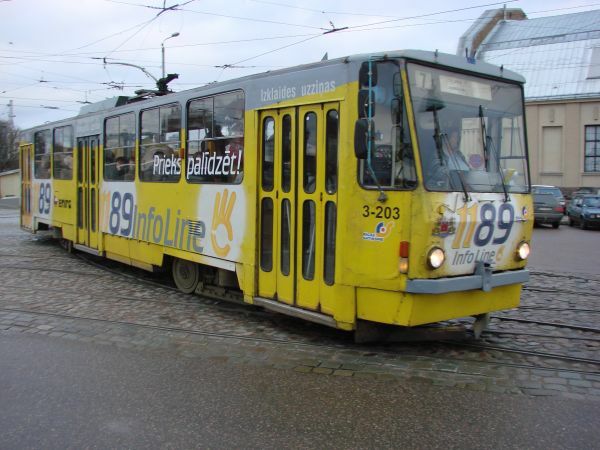 In 2002, 12 Czech-made T3D vehicles were purchased secondhand from the tram system in Schwerin, Germany. In 2013 a contract was signed to purchase 12 new Belarusian Belkommunmash trams as part of an infrastructure renovation project. 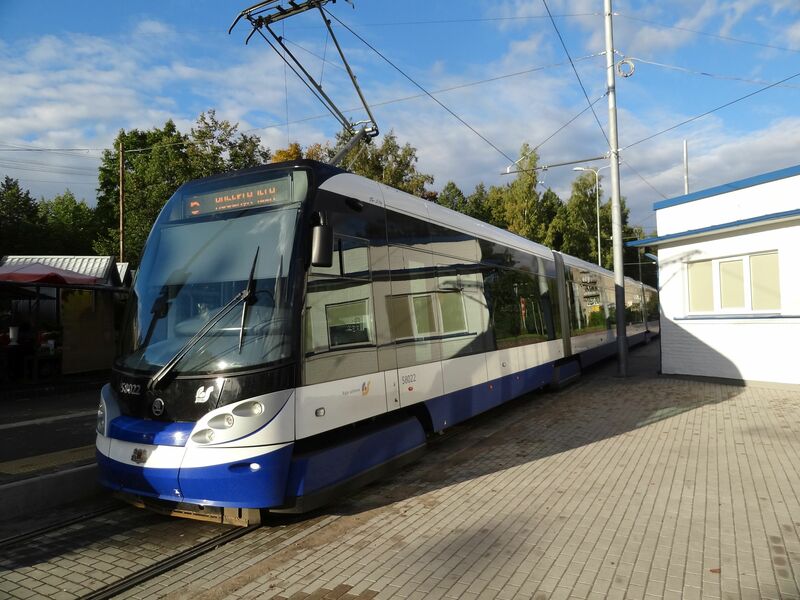 The new trams were expected to arrive in Daugavpils in August and to start running not earlier than October. However the contract was cancelled. 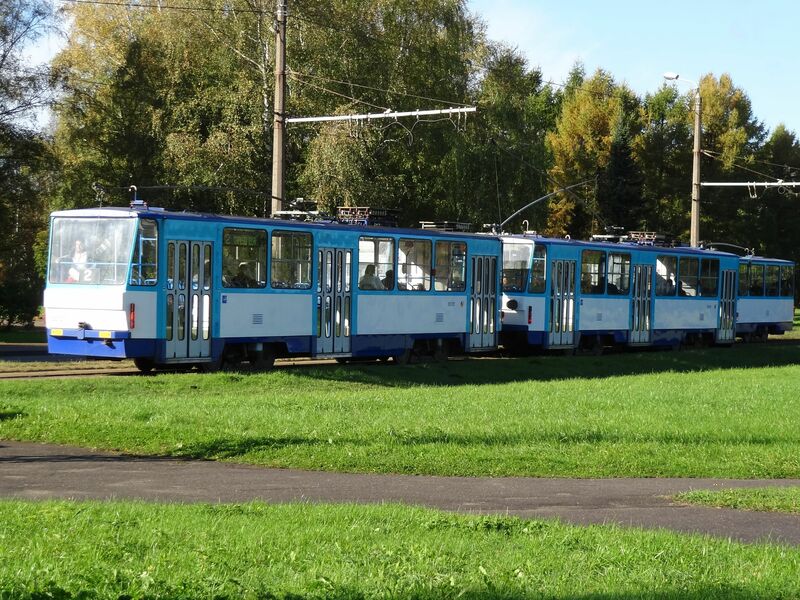 New Russian-made UKVZ KTM-model trams were purchased in March 2014. 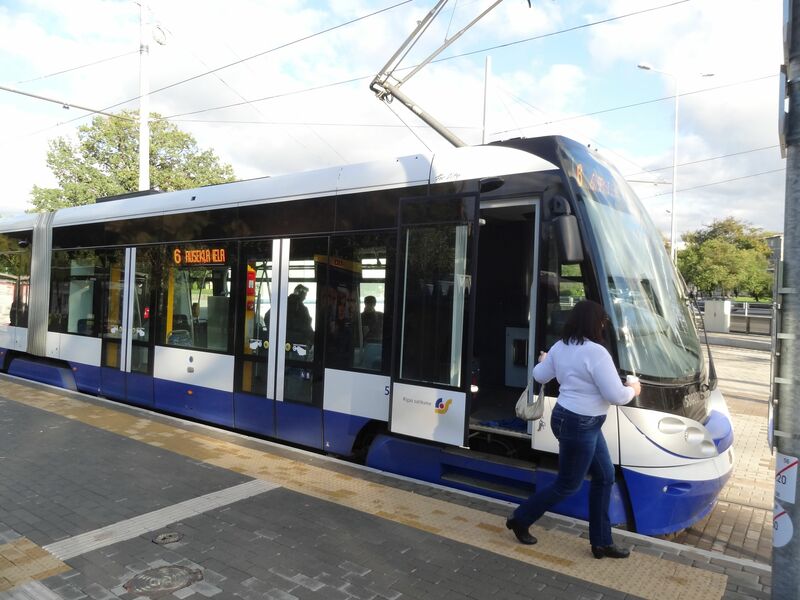 In September, eight partially low-floor 71-623 trams and four low floor 71-631 trams were delivered. 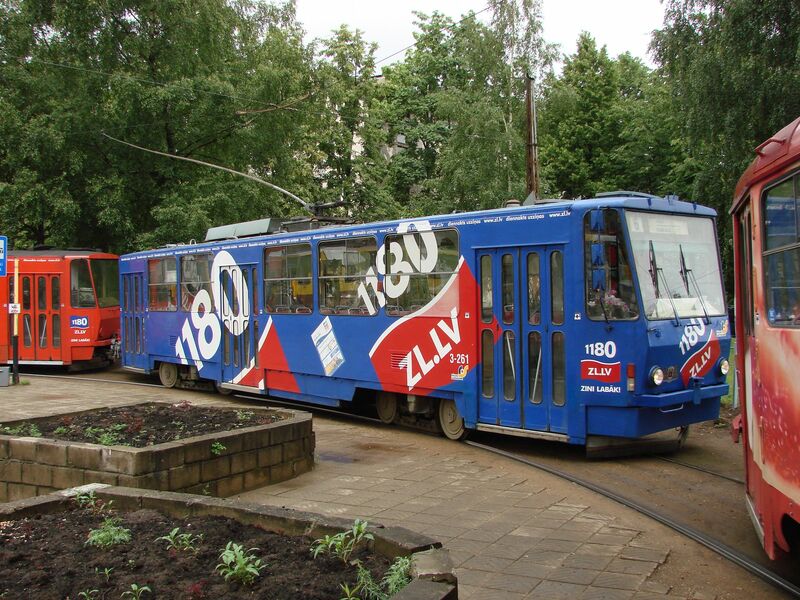 The Daugavpils tram in this and the following pictures is a model KTM-5 tram from Ust-Katav, Russia. As such they are quite a sight today in a western EU country. 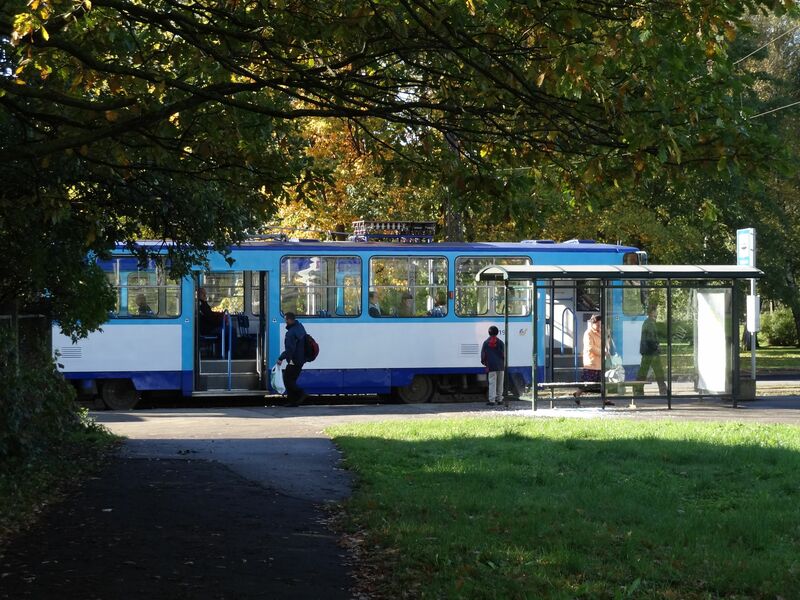 Picture of a KTM-5 tram no. 103 at the tram stop Klusa iela 27.6.2013 by Ilkka Siissalo. 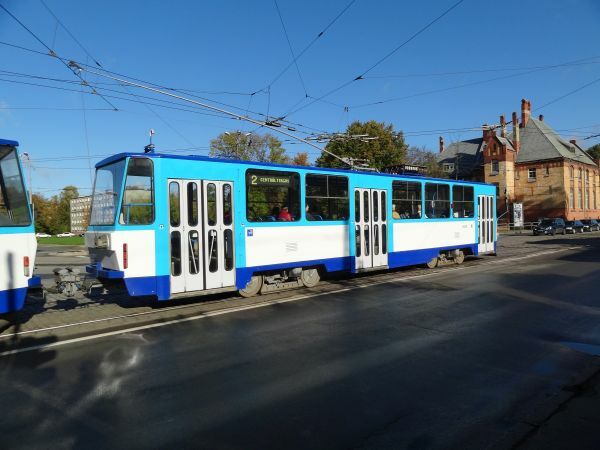 KTM-5 tram no. 103 approaching the tram stop Klusa iela. Picture 27.6.2013 by Ilkka Siissalo. 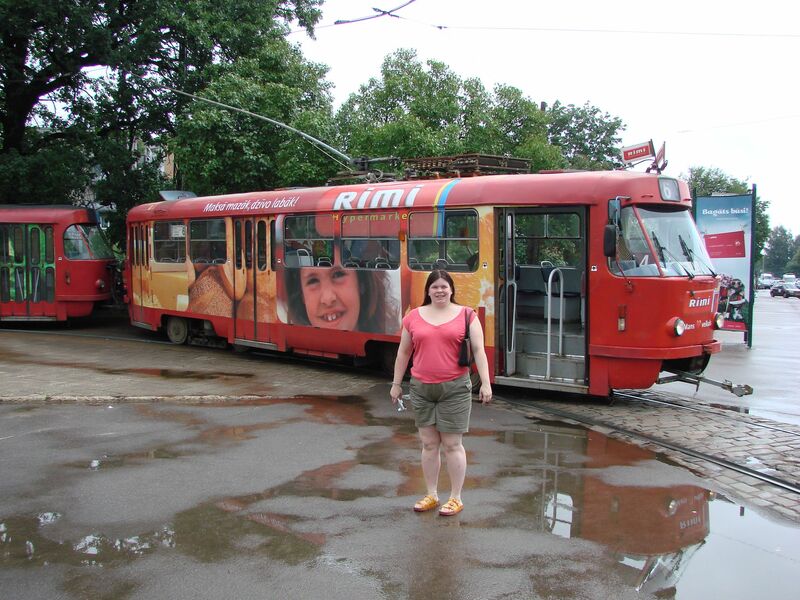 No, it is definitely not low-floor :-) KTM-5 tram no. 103 at tram stop Klusa iela. Picture 27.6.2013 by Ilkka Siissalo. The tram looks a bit "home made". 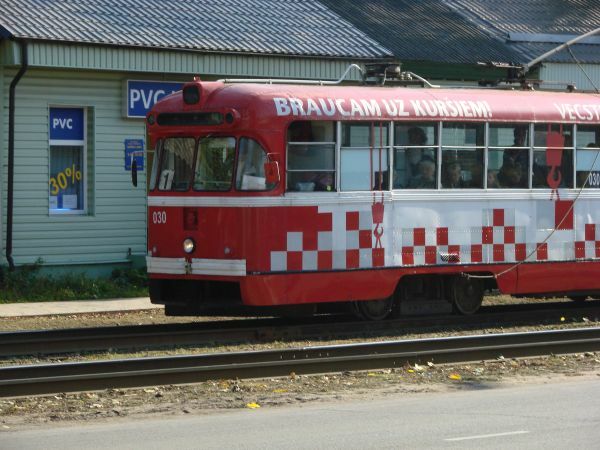 KTM-5 tram no. 103 at tram stop Klusa iela. Picture 27.6.2013 by Ilkka Siissalo. There it goes. Note the trolley bus style catenary wires and the trolley pole. KTM-5 tram no. 103 at tram stop Klusa iela. Picture 27.6.2013 by Ilkka Siissalo. 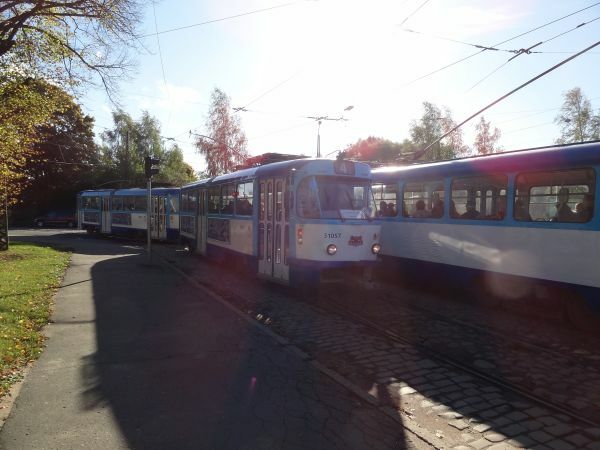 Two Latvian built RVR-6 tram units on Daugavpils tram line 1 at the "18th November street". Picture 25.9.2008 by Sanna Siissalo. 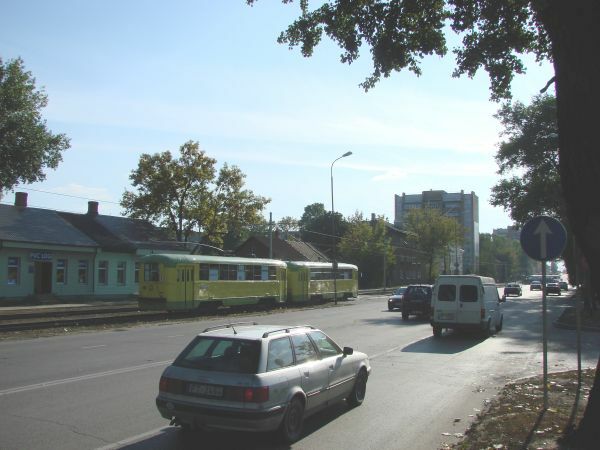 The same RVR-6 trams as above on the "18th November street". Picture 25.9.2008 by Sanna Siissalo. 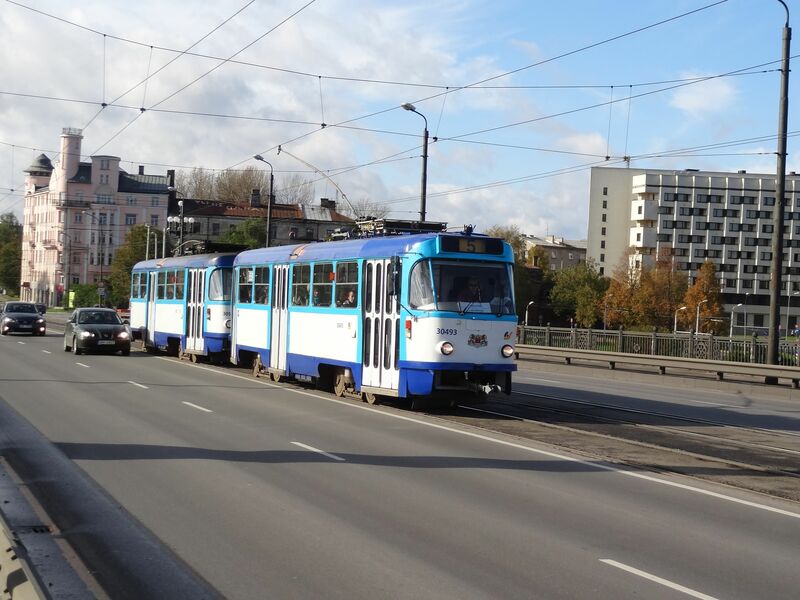 Another two RVR-6 trams on line 1 on the "18th November street". Picture 25.9.2008 by Ilkka Siissalo. Note the rope that the driver has to manually pull on the outside of the tram whenever the trolley bars need to be switched from the overhead catenary wires. RVR-6 trams on line 1 on the "18th November street". Picture 25.9.2008 by Ilkka Siissalo.